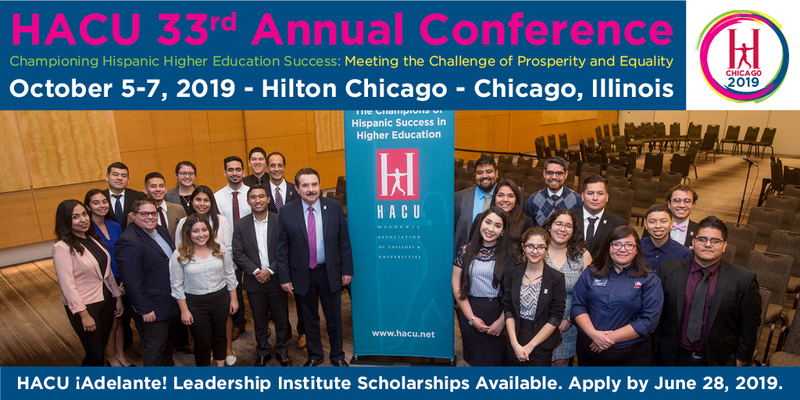 The Hispanic Association of Colleges and Universities is accepting scholarship applications from undergraduate students to attend HACU’s 33rd Annual Conference, Oct. 5-7, 2019, at the Hilton Chicago in Chicago, Ill. Students selected will participate in the student track component, HACU’s ¡Adelante! Leadership Institute. The HACU ¡Adelante! Leadership Institute Scholarships cover cost of registration and conference-related meals (one per day). Student applicants and selected recipients must be committed to serving as a HACU Leader-in-Residence and participate in professional development webinars and help promote HACU student programs on their campus. A limited number of scholarships are available and are provided to eligible undergraduate students. The scholarships are sponsored by HACU and its corporate, federal and non-profit partners. Students selected are expected to host a campus information session about HACU student programs (internships, scholarships, and/or other student opportunities) to help increase student engagement in HACU programs and advocacy efforts. The application deadline is June 28, 2019. The 33rd Annual Conference Scholarship on-line application requires a one-page resume. To apply, click here. For additional information on HACU’s Student Track, click here.